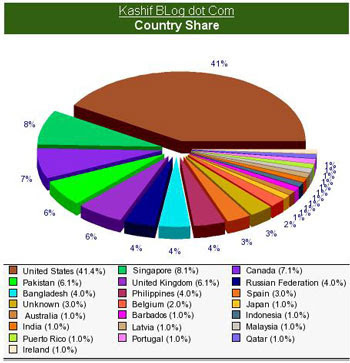 According to my Google Analytics repost , traffic to KashifBLog.com is 180% the traffic received in April’08 . As you can see from the above screen shot that traffic from referring sites is more than the traffic from search engines as well as direct traffic . Since this is not a very old blog so it will take some time to receive more traffic from search engines for which I keep working. Although the traffic is better but still very low traffic at an average of around 45 UV/day. Most of the traffic for this blog comes from blogging communities like Blogcatalog ,MyBlogLog,forums and not to forget Entrecard ! The good part is that over 40% traffic is from US and the rest from different parts of the world .This is going to come in handy when setting price for advertising on this blog which I haven’t done so far .